Yesterday evening( June 27th) the General Public x RH Celebration event took place at Restoration Hardware in LA. 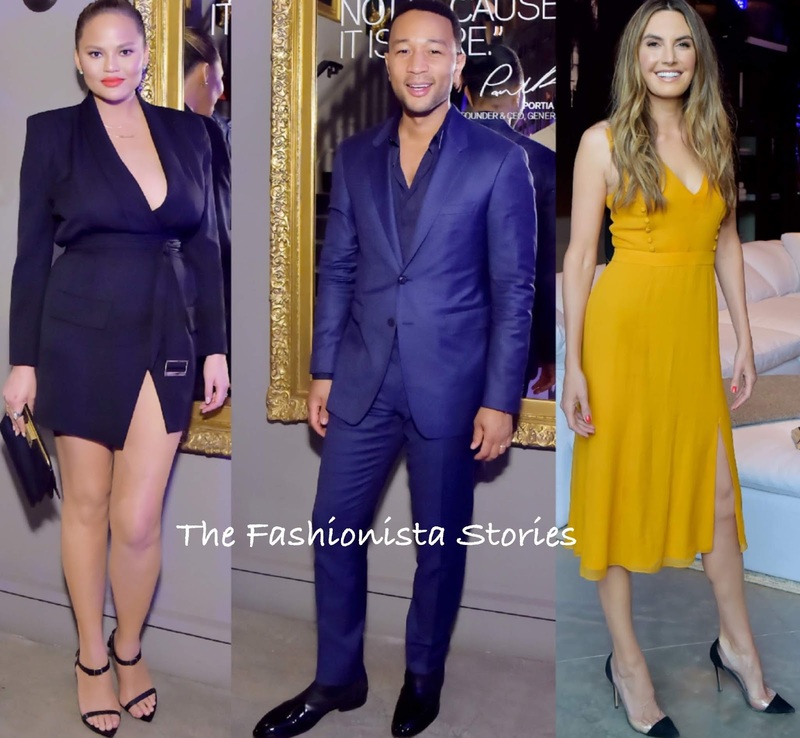 Chrissy Teigen wore a ALEXANDRE VAUTHEIR dress which she accessorized with an GIVENCHY clutch and SAINT LAURENT sandals. While I like the dress, I don't think it works on Chrissy. John Legend worked a two-piece blue suit with a blue button down shirt underneath. Sometimes wearing different pieces of the same hue can throw your look off but I think it worked here on John. Elizabeth Chambers worked a sunny yellow PRABAL GURUNG deep-v silk dress with a button detail bodice and a silt detail which is available at SHOPBOP. Keeping the styling of her look simple, she finished up with GIANVITO ROSSI pumps and center part waves. Ellen Pompeo went the casual route rocking a white tee shirt and ivory slacks. While she could have easily wore pumps or sandals, she opted for the white PUMA fur slides. I kinda like this but the pants needed to be hemmed. Portia de Rossi wore white peplum, tie waist top with the matching sheer panel trousers. Again, hemmed pants would have made this a better look. January Jones showed her midriff wearing a white crop top and white & sand stripe, wide-leg pants with pockets which she utilized. Despite the annoying creases, the casual look worked for the occasion.